Qu'est ce que cela veut dire? : Day Thirteen: "For the rest of us, what has been since has not been the same." Day Thirteen: "For the rest of us, what has been since has not been the same." 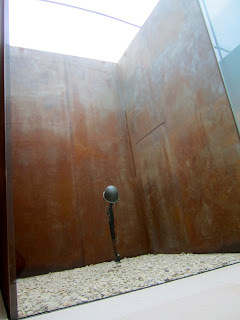 Today we set out for the Caen Memorial Museum. The museum was fantastic- the amount of information it offered to the public was incredible. Photos, video footage, newspaper articles, clothing (there was even a wedding dress made out of a parachute on display) and countless artifacts. We viewed a short video after our tour that was extremely humbling. We viewed a compilation of videos on a split screen projection- images that I would never wish to experience in person. Yet, the most moving part of the video was when an aerial view of the length of Omaha Beach was projected over the entire screen- the video flipped from the state of the beach in 1944 and the beach in its present state. It’s hard to imagine that a beach so full of hostility and conflict could also have the capacity to be so peaceful. I couldn’t tell you how many times chills ran through my entire body. Never will I be able to adequately express my gratitude to the American veterans, both past and present, who have risked their lives for America and the principles it stands for. After lunch, we set out for the Omaha Beach Memorial and Normandy American Cemetery. The museum was beautifully designed and really did justice to the events and emotions it was trying to represent. After I made my way through the museum, I walked to the cemetery. I was only able to see two of the ten grave areas from where I was standing, but there were already more crosses in the ground than I wanted to see. It was a cold and overcast day to begin with, but the slight drizzle that began to fall matched the somber mood. After viewing the cemetery, I made the trek down the cliff to the beach. Standing on the sand, I let everything from that day -the history, the visuals, as well as my own emotions- just wash over me. You can’t walk away from learning about such catastrophic events like that without it sticking with you- without recognizing something new about yourself amidst all the silent chaos playing out in your thoughts. On the way back to Bayeaux, our bus driver took us to see some of the remaining German bunkers that were open to the public. Personally seeing remains from the war, gaining that much more knowledge, as well as the ability to connect to the events in my own way are all things that I am truly blessed and thankful to have had the opportunity to experience.